The 69th Russian Chess Championship has just concluded in Novosibirsk with a victory for Alexander Riazantsev. If this name is new to many people, this is not surprising. His ELO grade of 2651 made him only the eighth seed of the twelve in the tournament so while his victory does not quite sit alongside Foinavon winning the Grand National or Leicester City winning the Premier League, it was still a surprise. 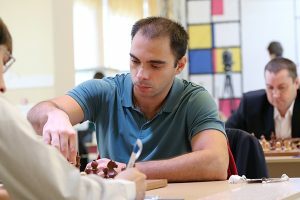 For the uninitiated, Riazantsev was born on September 12 1985 in Moscow and has been an international grandmaster since 2001. While he remained undefeated throughout the eleven rounds, his score of 7/11 included eight draws so it is fair to say that he can attribute his success to the fact that he achieved more wins (3) than any other player. However, just as the saying goes that the loser in chess is the one who makes the last mistake, the reverse is also true – that if you are going to win any game in a tournament, make it the last. Here is Riazantsev’s crucial last-round victory. If the men’s result was unexpected, the same cannot be said for the women’s championship where Alexandra Kosteniuk won her second title with a score of 8½/11. Her total included seven wins with only one defeat and victory in this, her penultimate game, gave her the title with a round to spare. It is worth noting that after White’s 59th move, the computer says that ‘Black is much better’ but after Black’s reply 59…a4? it has the position as ‘equal’, by 62…Qb3 ‘White is much better’ and after 64…Qa4? ‘White is winning’. BOARD 2 With the position of the match where it stood Mark Towlson was having none of the draw offers our Bob was making and slowly turned the game his way with a one pawn advantage. 2-1 to us. BOARD 1 David Erwee picked off a knight early on in our game after I stupidly left a pawn pinned and unable to retake. I then tried to make a comeback from his then all out attack on my kingside but he was too good for me and finished me off by 10.20. Result: 2-2 draw. 2016 played 1 drawn 1 – we are still unbeaten JUST! Regular visitors to this site will know that we take a keen interest in upcoming Chinese grandmasters, especially Wei Yi and Hou Yifan. Well, the highlight of the 20th Hoogeveen Chess Tournament running from 15-22 October in Hoogeveen Town Hall in the Netherlands is a 6-game classical match between Hou Yifan and Nigel Short. Before the match Short confirmed that he had once stated that ‘men on average play better than women’ but clarified it by adding ‘Hou Yifan is not average’! The first game took place this afternoon (Sunday) and Short appeared to have the edge as the game entered its closing stages. Hou Yifan dug in, however, and held on for a draw. She will be hoping for the sort of form that seemed to elude her at the recent Isle of Man International except for this gem in round one. A tough, close match took place at Broadstairs on Monday as the defending Hargreaves Shield champions kicked off the 2016/17 season with a home match against neighbours Margate. The team saw the introduction of Reg ‘the President’ Pidduck replacing Paul (Houdini) Carfrae who had gone missing on a year’s sabbatical. With the Gullbuster playing on board 1 and Broadstairs Bob on board 4, the match was incredibly close. The late night commenced with an early win for Broadstairs Bob, who always seemed in control and on target to deliver what was a valuable point. The Gullbuster on the top board went about his busting business, dominating the early stages and going an exchange up before suffering a shock defeat at the hands of Clive. With the match all square 1–1, the remaining matches lasted until almost 11.00. Broadstairs finally secured a point on board 2 after going an early pawn up and finally converting the advantage against a resolute Leon Garfield, who eventually succumbed to a checkmate under time pressure. With only minutes to spare, the President agreed a draw with Margate’s John Clarke in a pawn ending in which Reg had the edge but was keen to leave nothing to chance, thus securing a drawn game but a won match for Broadstairs.